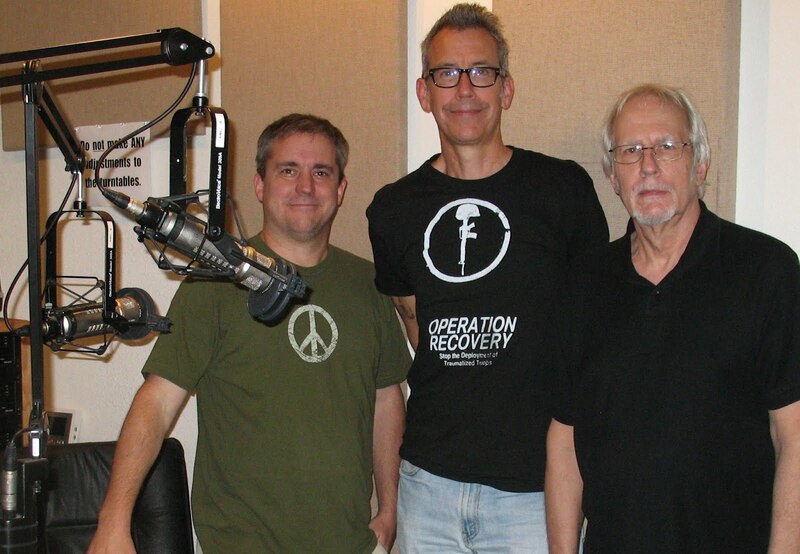 Jim Turpin, center, with Rag Radio's Tracey Schulz, left, and Thorne Dreyer in the KOOP studios, Austin, Texas, July 13, 2012. Peace Activist and writer Jim Turpin was Thorne Dreyer's guest on Rag Radio, Friday, July 13, 2012, on KOOP 91.7-FM in Austin, Texas. Turpin discussed issues raised in his article, "The Myth of American Exceptionalism," published at The Rag Blog on July 6, 2012. Jim Turpin, a native of Austin, Texas, who works in the field of public health, has a Bachelor of Science in Speech Communications from the University of Texas at Austin. He is a member of Code Pink/Austin and an associate member of Veterans for Peace. He also volunteers at Under the Hood Café & Outreach Center, the GI coffeehouse at Ft. Hood, Texas, and is a contributor to The Rag Blog. In his Rag Blog article, Jim Turpin pointed out that the United States is number one in the world in military spending with troop presence in over 150 countries; has record levels of hunger, poverty and unemployment; has seen the rise of an Orwellian national security state; and has experienced "obscene accumulation of wealth by a corporate plutocracy" -- with record corporate profits while middle-class American families have "lost a staggering 39% of their net worth." Turpin wrote that "America is indeed exceptional on many levels. We remain a country envied around the globe for our ability to create, think, and believe we can be a better place for all people. Maybe we only now are beginning to see that war, nationalism, wealth, and power are not the tools to make this happen." 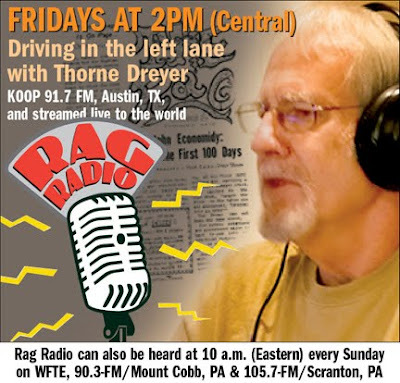 Jim Turpin discussed the myth of "American exceptionalism" on Rag Radio, Friday, July 13, 2012. Video by Jeff Zavala of ZGraphics, who filmed the show live in the KOOP studios in Austin. Coming up on Rag Radio: THIS FRIDAY, July 27, 2012, Actor, Musician & former Movement Lawyer Brady Coleman, with live performance by The Melancholy Ramblers. Brady will also be joined by Jim Simons in remembering the late Cam Cunningham of Austin's movement law commune.